When your guests demand popcorn and popcorn quick, the commerical popper party kit is the answer. 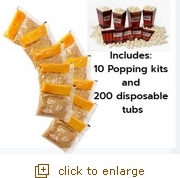 Our one of a kind popping kits make popping popcorn a breeze. Each pre-measured kit contains: Gourmet Popping Corn, Our Secret Buttery Salt, and our special Popping Oil! Just Snip, Pour and Pop! *Note: These popping kits are not to be used with the Whirley Pop.